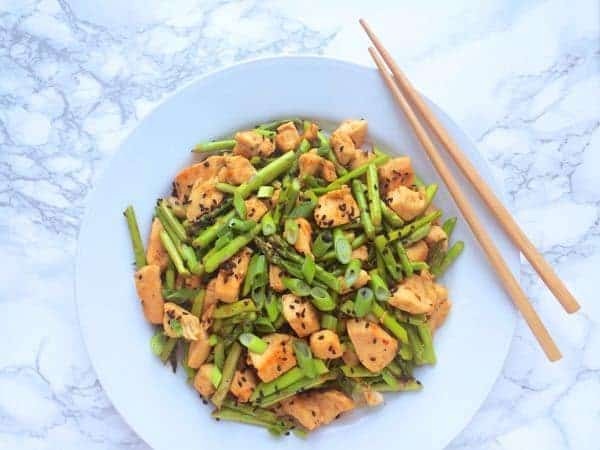 This quick and easy chicken and asparagus stir fry comes together in less than 15 minutes, ideal for a busy weeknight dinner. One of the reasons I love living in Michigan is the excitement and anticipation of each season. After a cold and cozy winter spent mostly indoors, I am so excited to head outside once again to enjoy the warmer spring temperatures. Of course with warmer temperatures comes spring produce which really gets my juices flowing. Asparagus season is a big deal here in Michigan. In fact, the state ranks third in the nation for asparagus production growing up to 25 million pounds annually. Who knew? Starting in mid-April and lasting just 6-7 weeks, when local asparagus hits the farm stands we eat it morning, noon and night. It’s delicious in a frittata, perfect in a pasta salad and ideal in a quick Asian stir-fry. 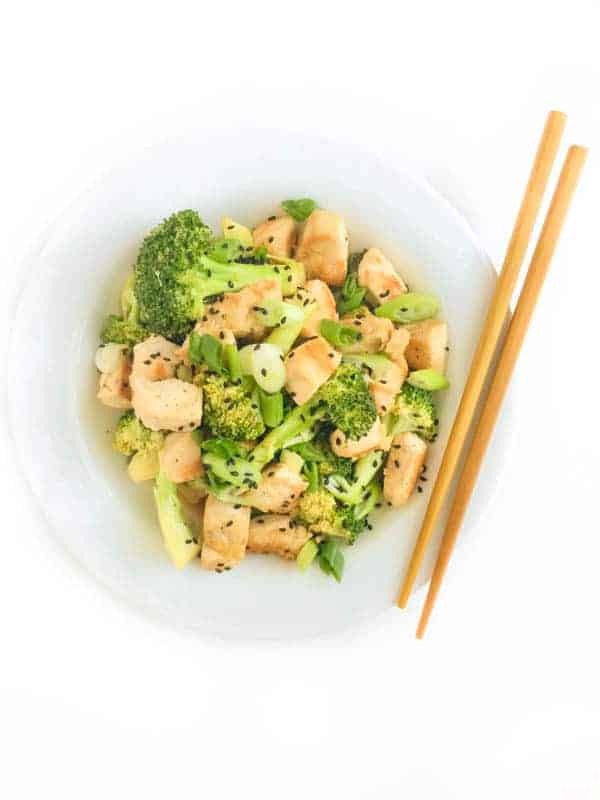 We typically use chicken breasts for stir-fries but ground turkey, pork tenderloin or beef sirloin would all work as well. 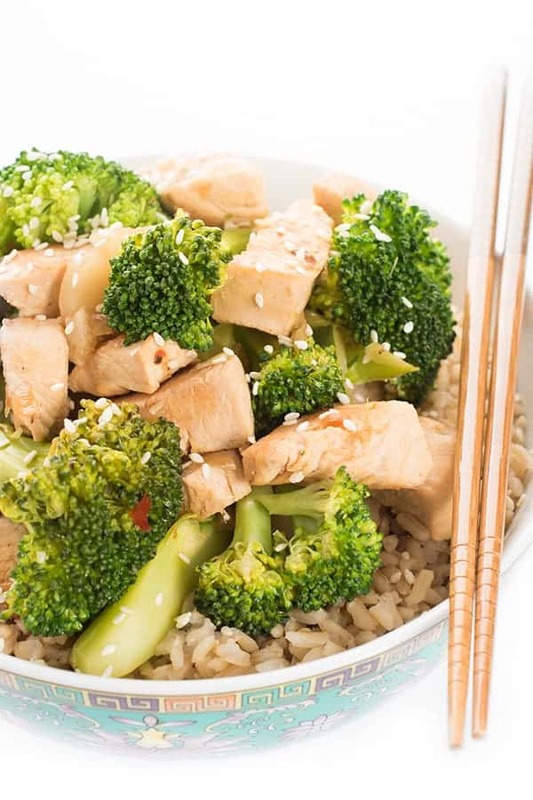 As long as you always keep a well-stocked Asian pantry, you are never more than 15 minutes from a flavorful, nutritious recipe your whole family will love. 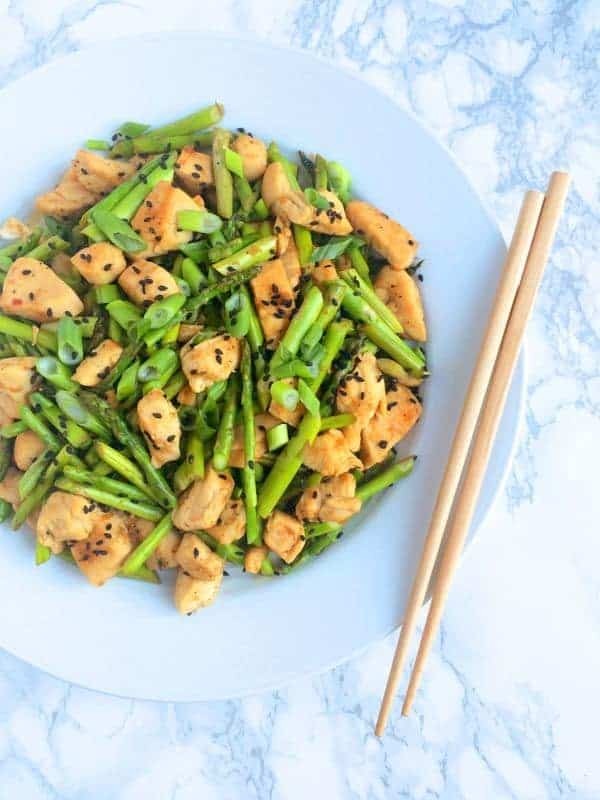 This quick and easy chicken and asparagus stir-fry comes together in less than 15 minutes, ideal for a busy weeknight dinner. Heat a large wok or skillet over medium high-heat and spray with cooking spray. Sprinkle chicken cubes with salt and pepper then add to the hot pan. Sauté until golden brown, about 7-9 minutes, then remove from pan; set aside. 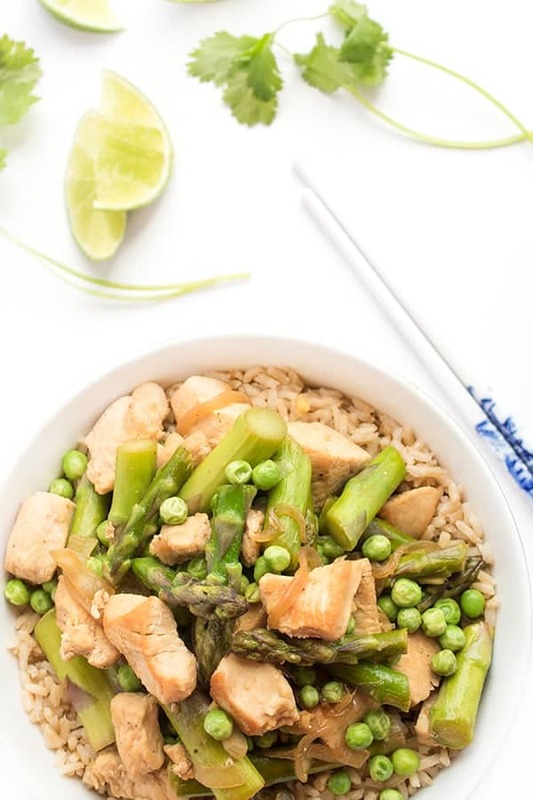 To the same hot pan, add asparagus and stir-fry until bright green, about 3-4 minutes depending on the thickness of your asparagus. 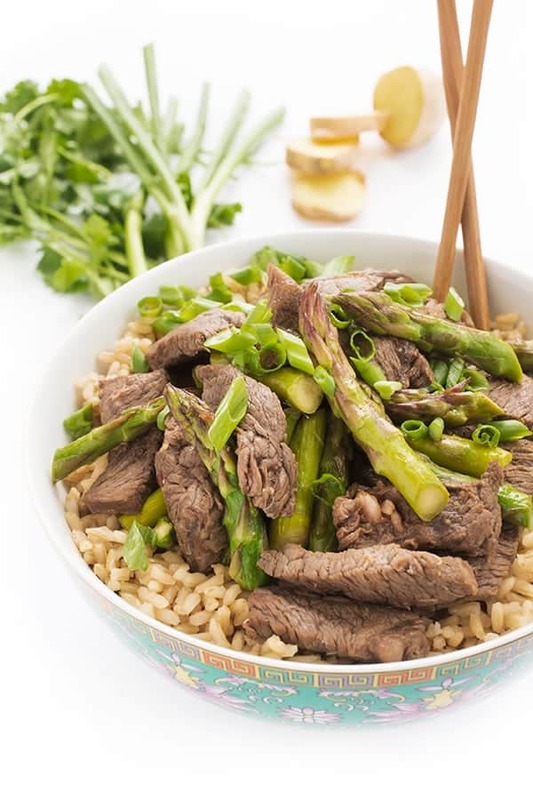 While asparagus is cooking, whisk together remaining ingredients in a small bowl: soy sauce, rice vinegar, hoisin, sesame oil, garlic, ginger and chili paste. Return chicken to the pan and pour in the sauce. Stir-fry until heated through and sauce becomes fragrant, 1-2 additional minutes. Sprinkle with sesame seeds and scallions before serving. Best new recipe I have made in a long time! I added a couple cloves of garlic to the chicken also. Has a really good kick! Hi! I’ve never used ginger root. Is it necessary for this dish? You can skip it but it adds a lot of flavor! Yes, yes, and yes! I’m going to make this all the time. Also going to try with green beans. I have been counting down the days to asparagus season! SO glad it’s finally here! Love spring veggie stir fries like this. Tell me about it!!!! Next up is strawberries!! This is such a fantastic recipe for a quick meal, such a fantastic alternative to take out, looks super yummy! Love how fast this dinner is to put on the table!! Exactly what my busy family needs…plus asparagus. We are all obsessed. What a perfect combination of ingredients! I love that it is a quick meal to put together too! Double win in my book! There is something about living in a place that has four distinct seasons which makes you appreciate each one, (although winter has definitely overstayed it’s welcome). I look forward to all the product that comes with each, and like you love when asparagus is in full force! Yes I completely agree Nicole. I wouldn’t trade it for the world! I love asparagus! It is one of my favorite times in Michigan! This looks delicious! 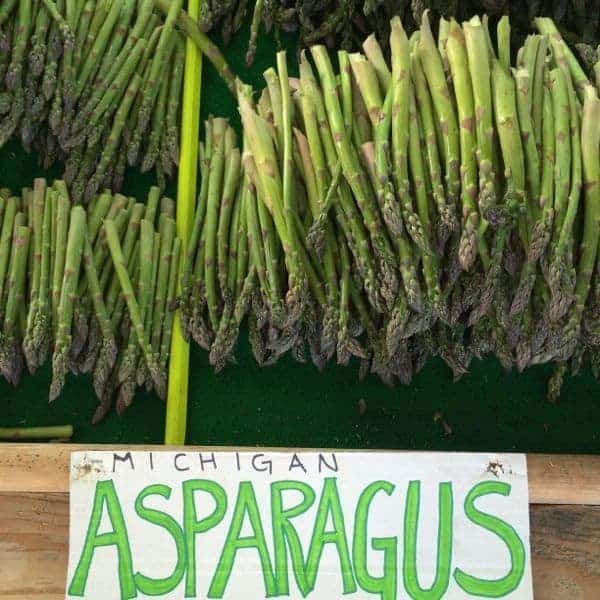 Its the best Michigan produce in the spring!! I’ve been stir-frying a lot of asparagus lately and its been such a treat. I never realized just how delicious it was until i was reminded of it. This looks darn good! Yes!! Plus it’s SO quick cooking!! It’s one of my favorites too! enjoy! This sounds sooooo good!!!! Looking forward to making it. Oh I just love stir- frys!! Yummy!! I love chicken and asparagus together. These flavors are perfect! Especially the toasted black sesames, love. I’m sure a black sesame seed nut! 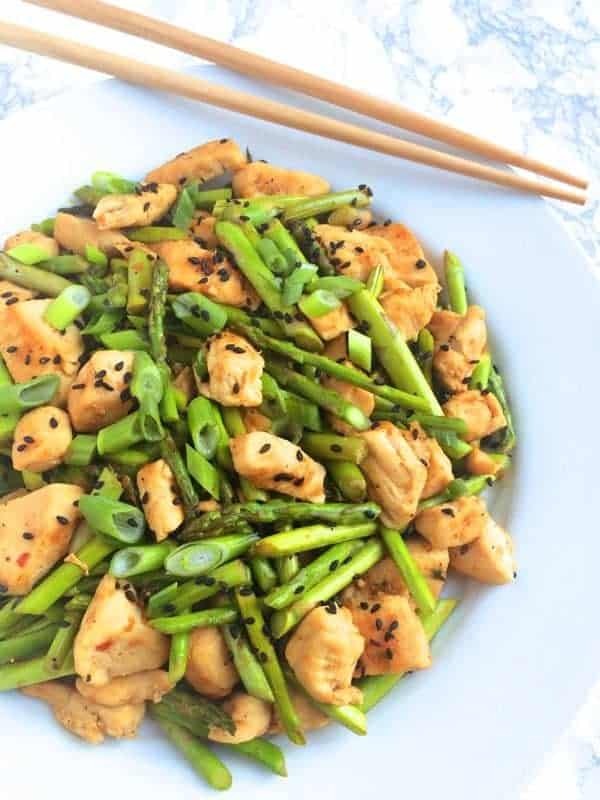 Love the idea of adding asparagus to this stir fry! I haven’t tried that but not it is on my list! I bet your boys would love it!! We love asparagus season as well. This looks so simple yet so full of flavor, Liz! Isn’t asparagus season the best?! Thank you for the nice recipe, Liz. I loved the Fall the best. The winters and summers were not too good for me. Michigan is a beautiful State. Fall is my favorite too. :) For sure! Well, I know what I am making for dinner tonight!! Have mercy. I miss your face! Happy SPRING! Now this is a great dinner idea this week!! Love! !